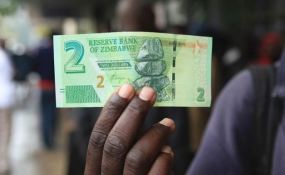 This follows Minister Ncube's announcement recently that the country will have its own currency within the next 12 months as Government moves to deal with inflationary pressures among other factors that are impeding economic turnaround efforts. In an interview with Bloomberg in Davos, Switzerland on Monday, Minister Ncube indicated that he is implementing a cocktail of measures that include enforcing fiscal discipline, cutting runaway Government expenditure as well as increasing compliance on the country's revenue collection front. "A lot needs to be done before the introduction of the Zimbabwean currency, which first of all is fiscal discipline, making sure we bring the budget deficit into single digits and that runaway Government expenditure is curtailed." He added; "Also making sure there is compliance on the revenue collection front -- we need to build the micro-institutions for full monetary policy conduct in the sense of introducing a monetary policy committee, making sure we put in place a framework for inflation targeting but also growth targeting. "Externally making sure we can begin to address our arrears in terms of what we owe to other nations, the Bretton institutions included, but fiscal discipline is key. "If you noticed what has been happening, since October 2018 the premiums in the parallel market have stabilised and this is because of fiscal discipline," said Minister Ncube. "On the fiscal front, we continue to make sure there is fiscal discipline, cutting back on Government expenditure, making sure that it is not the fiscus that is adding to inflationary pressures. In December we are expecting inflation that is single-digit indeed." "We are coming from a low base and then with the sharp hike in October 2018 that has moved us to a higher level of the index and that creates a technically higher figure on inflation, but if we look at month-on-month, the figure for the last two months, it is single digit," he said. This comes as the Zimbabwe National Statistics Agency, recently revealed that Zimbabwe's month-on-month food and non-alcoholic beverages inflation rate stood at 9,07 percent in December 2018, shedding 5,46 percentage points on the November 2018 rate of 14,53 percent.